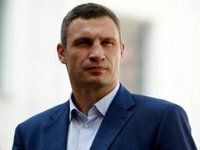 Kyiv Mayor Vitali Klitschko has attended the opening of the EMF EURO 2018 European minifootball championship, which started in Ukraine's capital on Monday, Kyiv City State Administration's press service has reported. "Matches will be held at the City of Sports complex on the Dolobetsky Island in Hydropark. Twenty teams from different countries, including Ukraine's national team, are participating in the competition. This is already the ninth European tournament held under the aegis of the European Minifootball Federation (EMF)," reads a report published on Monday. "It's good that more major international events - cultural and sports events – take place in Kyiv. We held the Eurovision Song Contest last year and the UEFA Champions League final this spring at a high level, and we are preparing to host the World Boxing Organization (WBC) Congress for the first time this autumn. I am also glad that today we are opening in Kyiv the European minifootball championship, which is admired by millions of people around the world," Klitschko said. The Ukrainian Minifootball Federation has existed since 2016. Since then, it has participated in all continental championships. Minifootball is an amateur sport in Ukraine. According to the rules, only footballers who did not have professional sports contracts during the last year can participate in the matches. The championship will last in Kyiv until August 18.